I’m a big matcha fan, love love loooooove it! I loved it so much I baked it and ate it. 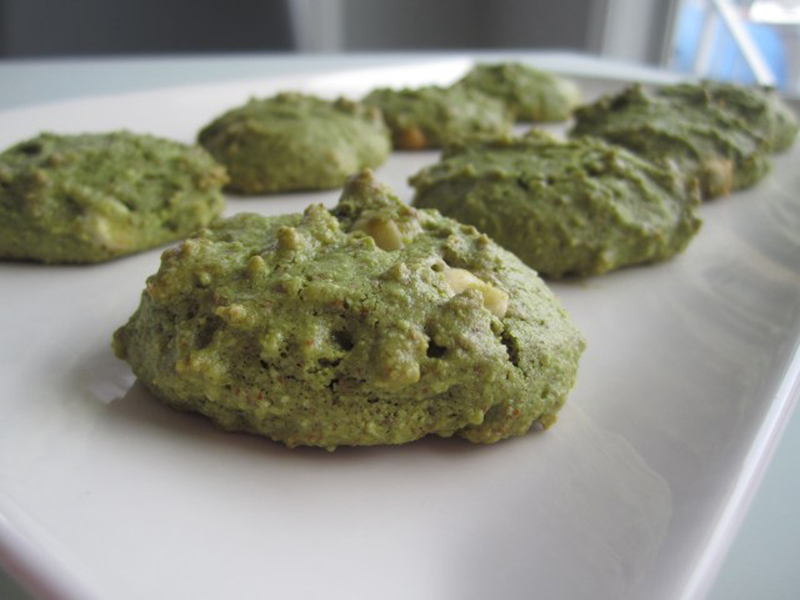 Here are some health benefits of matcha, followed by the recipe of one of my fav cookies. Let’s start with the almond flour! I actually blended some almonds using my Magic Bullet. I didn’t grind them coarsely, but enough that it’s close to a flour texture, leaving some almond chunks in there. If you have almond flour on hand, measure out about 1 1/4 cup and keep it aside. Add the almond milk, vanilla, egg and beat for another minute. Add both your flours, matcha, baking powder, salt and coconut. Mix well. A thick sticky batter should form. Pour batter by the tablespoon on to your prepared baking sheets. Place in oven for 13-15 minutes, or until edges start taking on a brown colour. High in Antioxidants, loaded with Catechin, boosts memory, increases energy & endurance levels and detoxifies the body. It also helps to relax the body, some say it puts the body in a meditative state while still being completely alert. Looks like you can eat these cookies guilt free!